This morning began with a hearty breakfast at the Famous Cowboy BBQ. 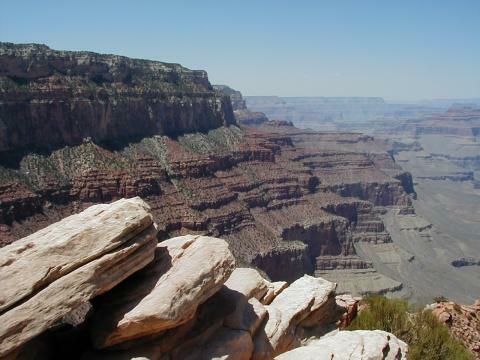 Following a web update, we took off for the Grand Canyon. We're getting used to the park entrance fees; the $20 pass didn't phase us. Alas, the park ranger at the gate wasn't as attractive as the last one. He was kind of scruffy looking. 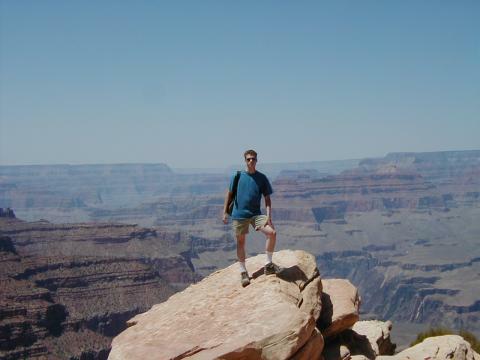 After entering the park, we stopped at Mather Point to take a few pictures of the canyon. 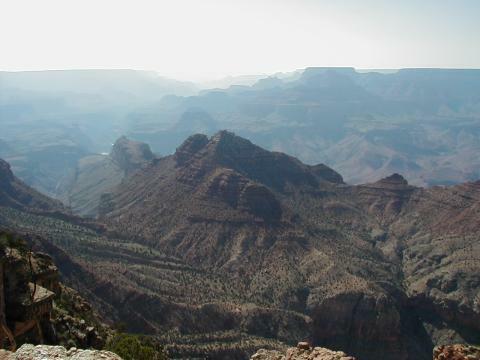 Upon seeing the canyon for the first time, Eleven exclaimed, "Wow, this is big!" 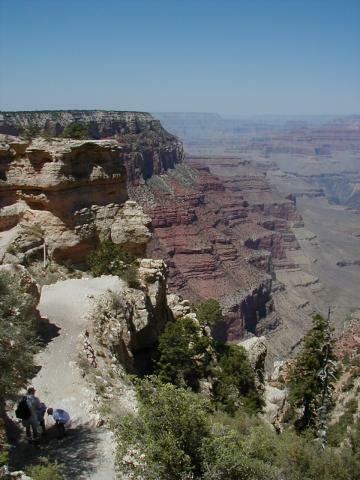 Fractional simply stated, "This canyon is grand." 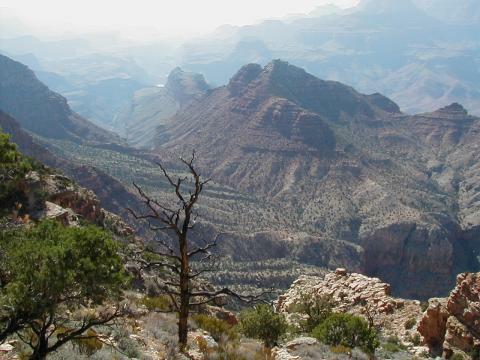 Not too far from Mather Point, we hiked part of the Kaibab Trail. 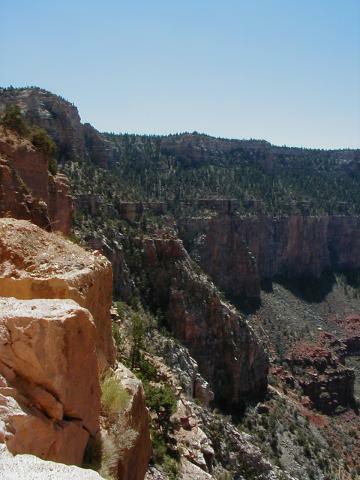 The trail winds through the canyon and to the other side, but we only hiked a mile and a half to a picturesque point. When the park rangers tell you that you'll drink a lot of water on the trail, they're right. We took just enough water to avoid dying on the trail, and we only went three miles. Following the hike, we grabbed some lunch at the IMAX theater, and watched an excellent film presentation about the canyon. We drove the length of the South Rim, stopping occasionally to enjoy the scenery, and then re-entered the plain old Arizona desert. We noticed that yesterday, we failed to provide a graphical representation of what we mean by desolation. 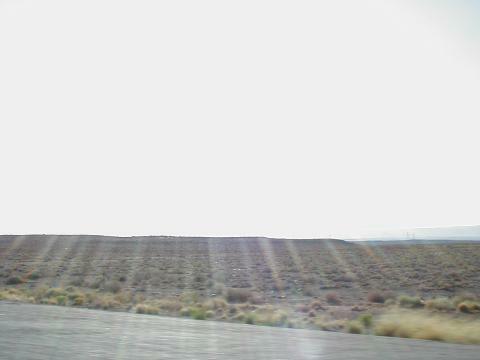 The picture to the right is what most of Arizona looks like, and is our working definition of the word "desolate." Tonight we're bedding down at the Woody Mountain Campground just outside of Flagstaff on Route 66. 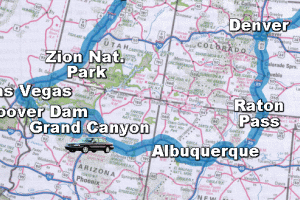 Tomorrow we embark for Albuquerque.